The former PM said it was a 12-month deal but here we are, four years later. Former Prime Minister Kevin Rudd: "What you now have is three years worth of subsequent abuse of that agreement by these people". CANBERRA -- A "tired" former prime minister Kevin Rudd has accused the Abbott/Turnbull governments of "abusing" the internationally denounced offshore processing and detention deal he struck in 2013 with Papua New Guinea, which just marked its fourth anniversary. What was announced on July 19, 2013, was supposed to be a 12-month deal to create the Manus camp, according to Rudd, but he told RN Breakfast on Thursday the deal turned permanent -- "What you now have is three years worth of subsequent abuse of that agreement." "Frankly, the bottom line is, these poor folks should have been resettled in either New Zealand or Australia or elsewhere three years ago." It comes as vigils were held overnight to protest against the continuing use of the camps on Manus Island and on the Pacific island nation of Nauru, places regarded by the United Nations and human rights groups as sites of gross sexual, physical and psychological abuse. The Immigration, and soon to be Home Affairs, Minister Peter Dutton has accused Rudd of revising history. "The thought that they were going to be there for 12 months is complete and utter nonsense," the Minister told Sky News. "It is a fabrication. It is misleading. It is deceptive." "Those people made the decision to put people on Manus island, and to keep them there." Dutton has confirmed refugees who are part of the U.S swap deal are expected to leave the controversial Manus detention centre in PNG at the end of October. He wants the Manus centre to close around the same as the refugees leave for the United States, but he has indicated that has not quite been achieved. That's more than three years beyond the original agreement, according to Rudd, although the memorandum of understanding (MOU) signed between the two nations in 2013 stated it was a 12-month deal "subject to review on an annual basis" through the Australia-Papua New Guinea Ministerial Forum. "We agreed to a 12-month agreement," Rudd told RN Breakfast from New York. "If it had been implemented in the manner by the 12-month point which did not met UNHCR standards as were included in the Australia-PNG agreement it would have been stopped forthwith. "What you now have is three years' worth of subsequent abuse of that agreement by these people. "And it is absolutely legally and ethically wrong for various parties to seek to hold our government at the time responsible for the implementation actions of Abbott and Turnbull." 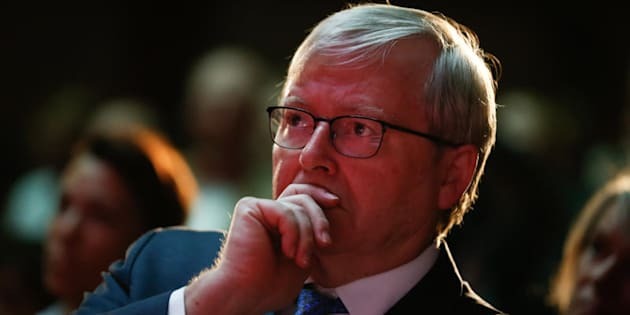 Rudd declared on Thursday he was a "little tired" of being held responsible for the deal which ended up being implemented by the Coalition after Labor lost power in 2013. Offshore processing, and the hardline vow that boat arrivals would not settle in Australia, were brought back as policy under Kevin Rudd just before the 2013 election in an attempt to blunt immigration attacks from the then-Opposition. Labor lost power two months later. "Frankly, I am a little tired of being held responsible for the non-implementation of an agreement that was absolutely explicit in terms of conditions on housing, welfare, accommodation as well as employment and proper treatment stipulated explicitly in the agreement at the time," Rudd said. "And we had to require Papua New Guinea to change its law in order to make sure it was fully compatible with UN standards. That's what we agreed to. "The implementation which was then undertaken by Abbott and by Turnbull is of an entirely different nature because their philosophy and approach and politics of dealing with asylum seekers was completely alien to what we trying to do."